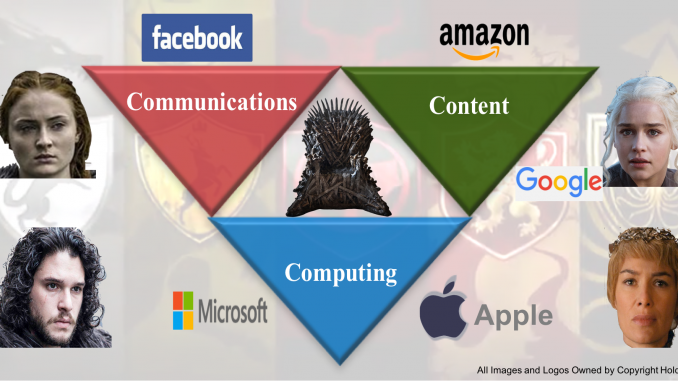 It has become commonplace to hear news from the Big 5 in technology – Facebook-Microsoft-Apple-Google-Amazon. FMAGA for short, if you are like me and can’t recall who is in the Big 5 club. One day we hear from them about the cloud or the Internet of Things. The next day we hear about new phones, laptops, their ultra-sharpness, or about gadgets that talk back at their owners. Then off we go hearing of brain mimicry with AI (artificial intelligence), world mimicry with VR (virtual reality), or balloon-powered Internet and drone-based witchcraft. What game of thrones are they playing? What is their playing field? What are they trying to control? Communications: Encompassing all forms of communications including telecom, collaboration tools, social networking, chat etc. Computing: From personal to business computing, smart devices to cloud computing and software stacks (middleware or PaaS, applications or SaaS, and emerging analytics and AI services). Content: Physical goods, virtual goods (digital content), gaming, and technology-enabled services beyond streaming, such as health care and transportation. We will see how each of the FMAGA started out their play in the 3C’s battlefield, how they have evolved, and briefly how they compare with technology veterans AT&T and IBM. Below is a depiction of our main protagonists FMAGA placed in in the 3C’s battlefield as they started their game in their home turfs (their heritage corners, so to speak). Communications: Facebook birthed social communications of the 21st century via the virtual social network and is fast trying to capitalize on their 2B+ active users. Computing: The longest running battle in its fourth decade is continuing between Apple and Microsoft in this realm. Content: Amazon rules in delivering us physical content from books to groceries. and virtual content through devices and streaming. Google’s heritage is also in this realm, started by giving us access to sellers and content via sophisticated search. Now that we’ve pinned their starting points on the battle field, let’s look at a decade of evolution in sixty seconds. Each player is assiduously protecting their core positions while ambitiously expanding to other realms. From each firm’s vantage point, moves towards other realms are either left or right as shown by arrows below. Yellow sticky notes show the product, the capability, or the initiative they introduced to make that move. Facebook: Moved left to content corner via Facebook Watch, the recently announced streaming service. Moved right to get cost-effective cloud computing via Open Compute Project (OCP). Trying to defend their hold on communications via Telecom Infra Project (TIP). Microsoft: Moved left with Skype acquisition for communications and collaboration and moved left again with LinkedIn, the business networking analogue of Facebook. With Facebook itself expanding to B2B services, the left side of this 3C’s battlefield should be interesting to watch as B2B and B2C approaches collide. Apple: Moved left to communications a decade ago and has since sold 1B+ converged mobile communications and computing devices. It strengthened communications with Apple Messaging and FaceTime; moved to the right and delivered content and apps via iTunes and AppStore. Google: Moved to communications (2B+ Android devices) and computing via Android, Chrome, and Google Cloud Platform (GCP); moved right to social and communications via gmail, Hangout (video/conferencing), and Google+. Amazon: Moved left to computing via the awe-inspiring Amazon Web Services(AWS) with Microsoft defending its home turf of computing solidly with AzureCloud; moving right with unified communications service, Chime. All this, while massively expanding the home turf of physical and virtual content and services. Here is a summary of the FMAGA offerings and initiatives in each realm of the 3C’s to show the middle game stage. [Note: An incomprehensive and ever-changing list]. Well, it’s a lot to process for sure, despite simplified categorization in three buckets! There is a lot more we can inventory here based on “moonshot” efforts underway in laboratories. The battle for the 3C’s is raging hard. It feels like we are still at the cusp of bigger battles to come, built on these lego blocks. Let us not forget last century’s behemoths yet. AT&T and IBM are shown below in their home turfs along with FMAGA. The new AT&T is clearly attempting relevance in the new world of media and entertainment by acquiring old-world players in content creation and delivery via Time Warner and DirecTV acquisitions. [See comparison of AT&T Ma Bell and Facebook here]. IBM is trying to cope in the new computing world of cloud and AI. Can Big Blue modernize and deliver its mind-boggling array of enterprise software and collaboration products from its cloud as fast as FMAGA? Can it repeat its services-led strategy in a self-service, prefabricated technology world of cloud? Can it use Watson as the rallying cry and umbrella portfolio cover (like say, WebSphere for middleware)? I hope the old guards give FMAGA a run for their money. Keeping the doors shut from the barbarians won’t be easy. (Note for the ardent game-of-thrones fans: As hopeful as I am about this, I hear a distant echo of the desperate “hold-the-door” cry from Hodor). FMAGA Next: Greater or Lesser? The battle will intensify in the content corner where technology-enabled services in health, finance, and transportation will drive upstream innovations in computing and communications. Big pieces of the game are in place for another decade of exciting play between the old guard in tech and industries, FMAGA, Asian giants, and as-yet-unknown new entrants. We won’t be watching from the sidelines, but will be active, if unwitting, participants in it.